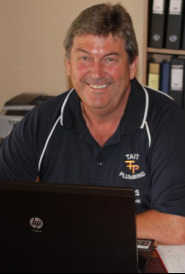 Mark Tait (Managing Director) commenced Tait Plumbing in 1993 as a domestic, commercial and industrial plumbing company, providing 24 hours / 7 days a week emergency plumbing for customers. Mark has worked in the Plumbing trade for 21 years before establishing his business bringing his plumbing experience to over 41 years. We are truly a family business, which includes Mark's wife Kati Tait, working in the administration side of the business. Both of their sons Matthew and Adam also work for Tait Plumbing along with other experienced plumbers. At Tait Plumbing, we assure you of our commitment for quality workmanship and adherence to all safety standards. We comply to all OH&S guidelines, as well as going to great lengths to keep our documentation up to date. In this way, you can be assured that you will only be receiving the finest plumbing work from our technicians, as well as a safe and efficient service for all of your plumbing needs. ​We, at Tait Plumbing, pride ourselves with prompt and excellent service, guaranteeing all our work.